As 2012 winds down, Google releases its Zeitgeist report reminding us of all the fantastic events, searches, news and happenings that took place during the year. That’s all well and good, but we’re a technology site so we care about the tech and geeky stuff. So how about those top 10 Tech Gadgets, Phones and Consumer Electronics? Fans of the Galaxy S III and Galaxy Note II have plenty to cheer about as both devices find themselves near the top of all three lists with that fruity company holding down the number one place all around. For overall Consumer Electronics, the Galaxy S III grabbed the number 2 spot with the Galaxy Note II landing at number 5. The Nexus 7 made an appearance on the list at number 4 as the top searched Android tablet of 2012. For Phones, it’s a little more of the same as the Galaxy S III lands in at number 3 with the Galaxy Note II holding down the number five-spot. Interestingly enough, with all the handset releases this year it’s the Blackberry Bold and Blackberry Curve that land in the number 6 and number 7 positions. Something about that just feels very wrong, given the sheer volume of high-profile handset launches from HTC that don’t appear anywhere on this list. As we turn to Tech Gadgets, we once again welcome the Galaxy S III at the number 3 spot, the Nexus 7 at the number 5 spot and the Galaxy Note II at number 7. Even the Galaxy S II makes an appearance at number 8 so we’re glad to see it’s staying relevant. As a bonus, you should absolutely watch Google’s 2012 Zeitgeist year in review video and remember back to 2011 when the Sidekick 4G sat at number 3 on the Consumer Electronic list. I noticed that as well, must be because it didn’t get popular until the very end of the year for the non-tech crowd. It’s on the other two lists though. I would think that the timing issue would apply to the Galaxy Note II, as well. In fact, I’m surprised the the iPhone isn’t on the list at all. Something is definitely odd there. In the “Phones” section the iPhone 5 and 4s are numbers 1 and 2, above the GS3 and Note. 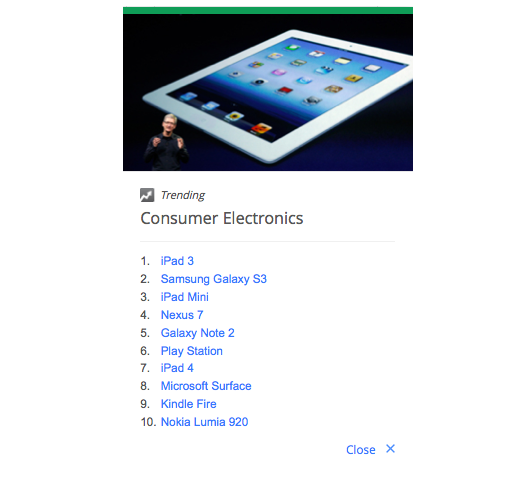 I like the Lumia 920, but there is no way it got more searches than the iPhone. In my mind the Galaxy S3 and Galaxy Note 2 are the BEST DEVICES for the 2012 year. Psy is making a cameo at the bottom…. GANGNAM STYLE! I’m confused to see why the GS3, GNII, and Lumia 920 beat out the iPhone when it had more searches. There’s either a mistake or a reason I have yet to figure out.